A wardrobe essential to cheer up the gloomiest day. 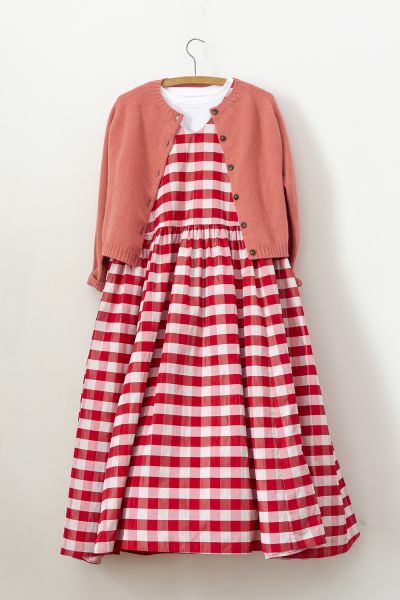 Made from a lovely red and pink checked Italian fabric it's luxurious feel make this a perfect dress for day or night. With a low v neck and narrow shoulders, attached to a loose high waist. Wear over a neat t shirt, underneath a cropped jumper or with one of our past season' blondie blouses. 100% POLYESTER. THIS IS VERY SPECIAL FABRIC WHICH IS REVERSED AND ALSO DOUBLED UP IN THE MAKING PROCESS. EACH LITTLE SQUARE IS WHITE ON THE FRONT AND RED ON THE BACK OF THE FABRIC. THE FABRIC IS ALSO SEALED AROUND EACH SQUARE TO GIVE A VERY LIGHT AIRY YET LUXURIOUS FEELING WHEN BEING WORN OR TOUCHED. CARING FOR YOUR ITEM. WE RECOMMEND CLEANING THIS ITEM WITH AN ECOLOGICALLY FRIENDLY DRY CLEANER AS THIS MEANS THAT NO POLYESTER FIBRES GO INTO THE WATER CYCLE. DO NOT BLEACH OR TUMBLE DRY. YOU CAN COOL IRON THIS ITEM IF YOU WANT TO.